I recently came across this book and knew that I needed to possess it immediately. Awesome-sounding plot aside, LOOK at that gorgeousness! It's that similar woodcut look that That Inevitable Victorian Thing has going on, but much more intricate, with a stunning simple palette and clever details that hint at the story's aesthetic. Like the little octopus at the top, the clock gears in the border, the bombs flanking the text. The watch makes a bold centerpiece. 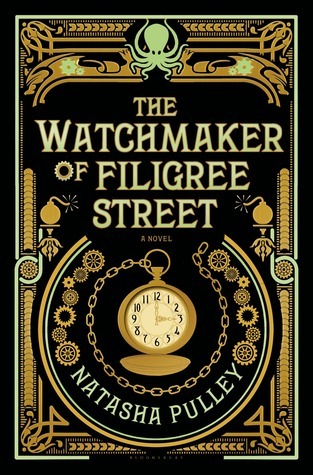 It's a cover that screams the kind of atmosphere you'd expect from a watchmaker who lived on a street called Filigree. I can't wait to read it!